Growers can free up valuable greenhouse space in the spring, by safely moving cool tolerant plants outdoors early. This space can be then be refilled with another crop. In addition to saving growing space, plants grown at cool temperatures "harden off" or acclimate allowing retailers to display plants safely outdoors earlier providing a greater selection of plants for early spring sales. Finishing plants outdoors is not a new concept. For many years growers have used cold frames, roll-out benches or put plants outdoors on black fiber cloth to maximize growing space. Some grower-retailers use a flat bed trailer or wagon to display pansies, bulbs, perennials and early vegetable transplants for sale. At night, if a hard frost is expected, they either cover the plants or roll the entire wagon into a barn or hoop house for protection. Today, with the availability of such a wide selection of annuals with different cultural needs, many growers do not know which plants are cold tolerant. Warm and cool crops are commonly grown and marketed together for late spring sales. 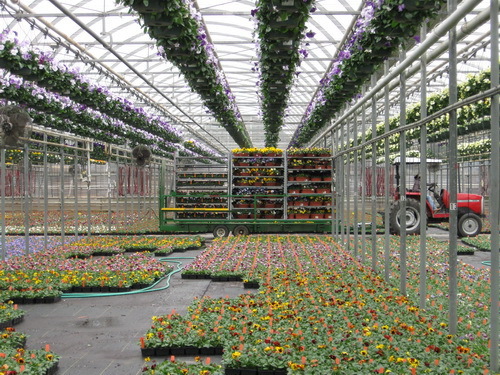 It is not uncommon to see cool crops such as osteospermums and nemesia being held in greenhouses for late spring sales along with warm season crops. 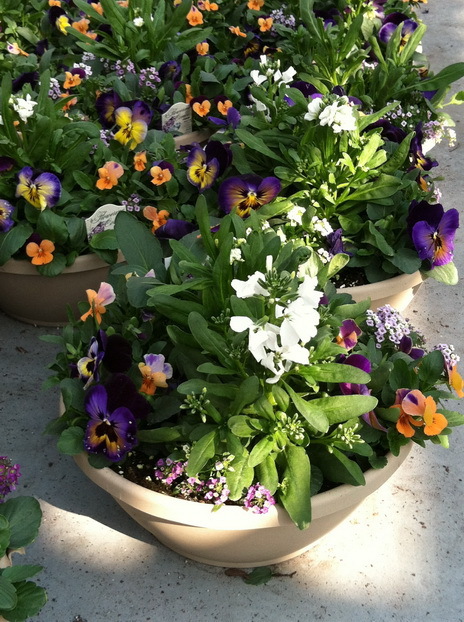 Some companies are working to change this by promoting annuals such as dianthus, diascia, nemesia and snapdragon that can be grown and retailed with pansies. Pleasant View Gardens has experience growing outdoors in New Hampshire. They developed a "Cool Tolerant Annual Program" that includes a list of plant cultivars, guidelines and even the sequence for which crops can be placed outdoors. Also see "Season Outdoor Growing" program from Four Star Greenhouse, Carleton, MI. Safely finishing plants outdoors depends on the genetic cold tolerance of the plants, the air movement around plants, how well plants are acclimated and how well the plants are maintained, once outdoors. The genetic cold tolerance of plants varies depending on where they originate. Tropical and subtropical warm crops such as alternanthera, angelonia, New Guinea impatiens, lantana, vinca, celosia, cleome, coleus, cosmos, gomphrena, ipomoea, melampodium, portulaca, sunflowers, zinnias and many vegetables are naturally sensitive to cool temperatures and are not a good choice for early spring outdoor yards. Herbaceous perennials and cool tolerant annuals, however, can be grown outdoors, but need to be acclimated or hardened off first. The hardening off process helps plants to adapt to freezing temperatures. If placed outdoors directly from a warm greenhouse and not hardened off, even perennials and cool tolerant annuals will be injured by low temperatures. The first step before moving plants outdoors is to choose cool tolerant plants and the second step it to acclimate them. Cool tolerant crops include herbaceous perennials hardy in your region and selected vegetative and seed annuals. Pansy, annual phlox , alyssum, osteospermum, nemesia, calibrachoa, verbena, diascia, bidens, antirrhinum (snapdragon), mimulus, lobelia and petunias are some cool tolerant annuals to try. Begin with just a few plants for outside production and experiment with cultivars, making adjustments as needed. Some varieties of the same type of plant have varying degrees of cold hardiness. Learning which plants perform best will take some experimenting. Plants will adapt best to cooler temperatures when they have a well-established root system. To accomplish this, begin the crop cycle by growing on at their optimum temperatures. Following guidelines from Pleasant View Gardens , once plants get to their desired size, lower the greenhouse temperatures to 45° – 55°F for at least a week. Growing plants for a week or more at these cool temperatures will acclimate them for outdoors. When scheduling your crop, consider that plants grow very slow under 50°F and flowering is delayed by colder average daily temperature, so adjust accordingly. Monitoring the weather forecast is an important part of growing outdoors. As a guideline, avoid moving plants outdoors if a hard frost (colder than 28°F) is predicted at any point within at least three nights of when plants would be put outside. Minimum recording thermometers are a wise investment for monitoring an outdoor production yard. When mild weather is predicted, move the plants outdoors and provide plants with adequate space to allow for good air movement. Avoid placing plants in low-lying areas because frost will more likely settle in these areas. Cold, dense air flows by gravity to the lowest areas where it collects. This causes temperatures to differ in relatively small areas, called micro-climates. Botryis blight and lack of fertilizer are two common problems which occur with outdoor growing. To prevent Botrytis, water plants in the morning and let the foliage dry before night. Plants growing outdoors may require less water and less frequent irrigation and this means that plants are fertilized less often. Although plants are being grown cool, it is important to continue to fertilize plants and maintain proper fertility. Pay particular attention during rainy periods and monitor plants for both Botrytis and nutrient leaching. It is especially important during cloudy, rainy weather to keep plants in outdoor areas clean. Remove dead and injured foliage and spent flowers. Apply fungicides as needed to prevent Botrytis. Water soluble fertilizer will likely be needed to maintain nutrition. Be prepared to cover plants if temperatures go below 28°F. An over-wintering thermo blanket such as polyethylene or polypropylene foam can be used for this purpose. Occasionally plants grown outdoors do get damaged by cold temperatures. Damage to plants at temperatures below freezing is called "frost" or "freezing" injury. Frost injury occurs when ice crystals form inside the plant tissue at temperatures below the freezing point. The temperature at which freezing occurs depends on to what extent the plants have hardened. Hardening involves both avoidance and tolerance of freezing. Plants with symptoms of frost injury wilt, and damaged tissue is water-soaked and turns dark brown or black. Plants can also be injured by cold temperatures above freezing. This is called "chilling injury" and occurs primarily on tropical or subtropical plants. Plants with chilling injury usually wilt severely and do not recover. Once frost injury occurs there isn't much one can do. Depending on the extent of the damage, injured growth can be cut back and plants may grow out. Information available on frost protection using overhead irrigation for strawberries and other field crops is probably not practical for herbaceous ornamentals. Growers use dew points to estimate how quickly the temperature might drop during any given night and use overhead sprinklers to prevent frost injury. When the water comes in contact with plants, it begins to freeze and releases heat. As long as a thin layer of water is present, on the bloom or on the ice, the blossom is protected. It's the water constantly freezing that keeps the temperature above the critical point. However, container grown herbaceous plants would be susceptible to breakage due to the weight of the ice and the excessive amount of water and cold, wet roots would cause other problems. One way to minimize the risk of frost damage and to have more control over the environment is through the use of roll-out benches. Growing space can be doubled by placing one layer of plants on a heated floor and a second layer 20-30 inches above the floor on a rack system. During the day the trays can be rolled outside the greenhouse onto a matching pipe network. Both crops receive full sunlight. At night, they can be rolled back into the greenhouse for protection. This system can be adapted to both hoop houses and gutter-connected ranges. This system is also good for hardening off bedding plants during the spring and for potted plant production in the fall. Another way to minimize the risk is through the use of unheated, covered cold frames. A cold frame is a rectangular box with the back higher than the front, covered with a transparent roof. The temperature difference between the inside and outside of the frame is generally not more than 5°-10° F. A mat or blanket may be placed over the frame on cold nights to conserve heat. Often the temperature inside the cold frame may differ from outdoor temperatures by only a few degrees. There are times, however, when a few degrees can be very important in preventing cold injury. Cold frames should have a southern exposure to receive the maximum amount of sunlight. The site should have good natural drainage so there will not be excess moisture beneath the bed. When ventilating, raise the top on the side opposite that from which the wind is blowing. This prevents wind burn on young, tender plants and loss or damage to the cover by strong winds. Without some sort of protection, you are always taking a chance when growing outdoors in early spring and occasionally plants will get damaged. By choosing cool tolerant plants, acclimating plants, closely watching weather forecasts and providing extra protection when needed, you will minimize the risk, grow higher quality plants and provide an extra turn in production.